Considering purchasing the Chauvet Freedom Stick Pack? Have questions? Ask people who've recently bought one. Do you own the Chauvet Freedom Stick Pack? Why not write a review based on your experience with it. This is now my 4th set of Freedom Sticks absolutely love how they look all synced together. The reaction of people when they see the sticks is very pleasing. Great that you can place them where you want and move easily as no wires involved. The instructions on how to get all 4 lights in sync. a bit difficult to fathom. Great Product however beware if you use the remote? Great product as always with Chauvet, however beware if your using the included IR remote control with other IR fixtures as this remote code seems to interfere with my ADJ PAR cans? I was using the black-out command on the Freedom Stick remote, after a while I noticed some of my ADJ PAR cans were flashing BLACK and therefore were blacked out? It became really difficult to reverse this as if I pressed the Blackout again to turn these back on other fixtures would then black out?? In the end I had to switch everything OFF and back on to reset this feature, not good during a live set :-( I wouldn't thought a product from a different brand could upset other features from a different manufacture? so for that fact I'm only giving them 4 stars, now I've had to purchase their wireless DMX transmitter so I can control these remotely and NOT use the supplied IR remote! These are brilliant! Very easy to use and can place anywhere. I do however recommend looking at the Youtube video in setting up as the instructions aren't as clear as they could be. Great lights. Easy to set up and pack down and also pack really securely into the provided bag. Great service by DJkit to deliver them to me quickly. Of all the lighting effects I use, Freedom Sticks get the most comments from clients at my weddings. They can be used for all manner of effects from subtle twinkles for first dances, fades and colour changes for slower songs to all out patterns for a party feel. The included IR remote allows access to all programs and scenes from behind the DJ booth and the fact that they are wireless and battery-powered means they can be quickly and easily placed anywhere. I have two sets and love them. Charge time is a very reasonable 4-5 hours and they will run for 8hrs on full or longer with chases or reduced brightness. 100% recommended. Very good wireless light kit. Love it, will buy another one soon. Easy to set up. Stylish looks. What's not to like! 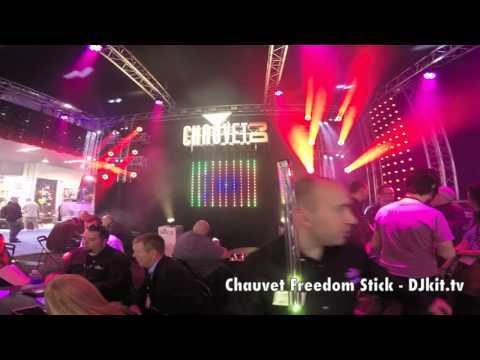 Seen a video for Chauvet Freedom Stick Pack online or have you own video? 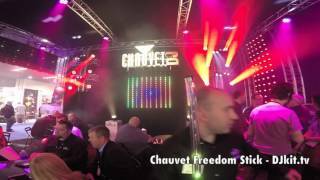 Check out Chauvet Freedom Stick Pack on DJkit.com!